For the third year, the Maker Faire in San Mateo was geek-and-crafter's Heaven! It is put on by Make Magazine and Craft Magazine. It's a hands-on free-for-all for participants to show off their work, convert new hands and minds to a favorite hobby, sell stuff to feed their hobby habits, and generally have a good time. Attendees like me can try new things, marvel at artwork and crafts we'd never have thought of, and learn from experts. There were a lot of textile-related crafts around, such as knitting, crochet, sewing, needle felting (I learned that at the Maker Faire last year! ), and batik. People were sitting around crocheting animals from wool yarn, needle-felting fruit, and refashioning all manner of clothing on the spot. Other people were making leather masks or showing purses made of aluminum can tabs. A woman named Teresa Mak had an interesting display called Batik Chic where she showed tools and materials she uses for her batik artwork. One thing she showed is that if you use pure beeswax for the batik, you can't get the traditional cracking effect because the beeswax is too flexible. You need to use a combination of waxes such as paraffin to get the cracked effect. Interestingly, with all that textile crafting around, I didn't see much tie-dye. I didn't see any actual exhibits of tie-dyed materials or techniques (though maybe I didn't look hard enough). 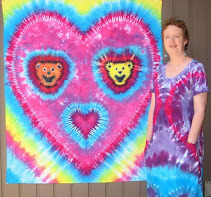 I saw a lot of people wearing tie-dye, but they were mostly kids, and the patterns were almost all (purchased) swirls. Pretty pedestrian. What Possessed Them to Do That?! ...or "art cars" covered with marking pens or other objects. There were many art forms that would never occur to me, but that were really beautiful, such as the giant sculptures made of rusty steel cables. One of my favorite displays was Sisyphus V by Bruce Shapiro. The people watching at the Maker Faire is fabulous! Many of the people there become their own artwork, with brightly-colored hair, elaborately trussed-up dreadlocks, and fabulous one-of-a-kind clothing concoctions. Other people dressed as they would for any other summer festival, in khaki or denim shorts, comfy t-shirts, sandals and hats. I think the highlight for people and fashion watching was the Swap-O-Rama-Rama Fashion Show. In a great example of "reduce, reuse, recycle", many of these folks had spent the day creating new garments from old garments swapped by attendees (I swapped some of my old red stuff for somebody else's old blue jeans), and then got up and paraded them on the catwalk stage. Many of the results were both outlandish and beautiful. This cool set of outfits is by Velvet Valentine (the 2 pictures above and the following picture). These bicycle-based outfits below don't look very comfortable (note the metal gears in the center of his chest), but they sure are striking! Finally, my personal prize for "Best Use of Recycled Materials" goes to the Portable Guerrilla-Gallery for their giant tent made of old billboard covers and other salvaged materials. All the art inside was made of recycled materials as well! Now I need to figure out what to do with all those recycled blue jeans I picked up at Swap-O-Rama-Rama!